From the misty Highlands of Scotland, deep in the "Valley of the Deer" comes Glenfiddich, the world’s best selling Single Malt whisky. Probably the Single Malt that most people picture when discussing this style, Glenfiddich has a long and interesting, and can be thanked for its huge role in establishing Single Malts on the world stage. Owned by drinks giants William Grant & Sons, named after the man who initially founded the distillery way back in 1886. Glenfiddich have consistently bucked the trend and flown in the face of critics: increasing production during prohibition, marketing the single malt at a time when blends were the biggest products, and remaining proudly independent as other distilleries were claimed by large conglomerates. The distillery is known the most successful single malt whisky brand in the world, and one of the largest, producing over 10,000 litres of pure alcohol a year! Known for their fresh, verdant and appley spirit, Glenfiddich’s familiar triangular bottle can be found behind nearly every bar in the world. In recent years they have moved beyond their ubiquitous 12 year old to introduce several new bottlings, including a 15 year old, an 18 year old, a 21 year old and other limited and rare bottlings. Some of these have become real cult drams, such as 2010’s Snow Phoenix, made from whisky reclaimed from a warehouse which partially collapsed under a heavy snowfall – a genius piece of marketing typical of the Dufftown powerhouse. William Grant had long harboured an ambition to build a distillery, something he finally achieved in 1886. He enlisted the help of his nine children and a stone mason friend, and named the operation "Glenfiddich", Gaelic for "The Valley of the Deer". From the very start, the cards were stacked against Grant and his family- the distillery was founded with merely £120 worth of capital, and was entering a market full of competition in a period of boom. Yet, against odds, Glenfiddich and the Grant family, rose to become some of the biggest names in distilling. The first spirit trickles from the distillery’s copper stills- bought second hand from Cardhu distillery- on Christmas day of this year. Grant expands his portfolio by building his second distillery, in many ways a sister distillery to Glenfiddich, Balvenie. Glenfiddich begins to bottle its own whisky after its foremost customer, the Pattisons blending house, goes bankrupt. One of the Grant’s first blends, Standfast, quickly achieves popularity and becomes one of their flagship brands. In a forward thinking marketing move typical of Glenfiddich, Charles Gordon, who married William’s daughter Isabella, begins travelling the world selling the whisky. William Grant’s grandson, Grant Gordon, joins the family firm, taking charge of the company after William’s death in the same year. This was during the height of prohibition, yet Gordon took the bold decision of increasing the distillery’s production. At this point they were one of only 6 distilleries still operating in Scotland. This gamble was repaid when the distillery was in a good position to meet the surge in demand when prohibition was eventually repealed. The iconic triangular bottle is introduced, designed by visionary designer Hans Schleger, also responsible for some of the most memorable poster designs of the Second World War. He was inspired by the "Holy Trinity" of distilling- malted barley, water and air. The bottle came at a time when liquor shops were filled with rows upon rows of nigh-identical circular bottles, and really made Glenfiddich stand out from the crowd. This is just another example of the distillery’s progressive marketing techniques. After nearly 80 years of usage, the floor maltings at the distillery is closed. These days, all but a handful of distilleries in Scotland have closed their floor maltings. In one of the most important moves in modern whisky history, Glenfiddich takes the decision to heavily market its ‘Single Malt’ worldwide. At this point, blends were so utterly dominant, that Single Malts – or ‘Pure Malts’ as they were often called – were a rarity, nearly always found only in Scotland. Glenfiddich had to totally establish a new industry section, and a new aspect of the luxury goods market. They did this extremely successfully, and a lot of credit can be afforded to Glenfiddich for establishing Single Malts in the public eye, allowing other distilleries to produce and market their own Single Malt whiskies. Again showing they are ahead of the curve, Glenfiddich is the first distillery to open up a visitor centre, attracting tourism to the distillery itself. This is something that many distilleries have followed, creating their own visitor centres and guided tours. Production is increased when a whopping 16 new stills are installed at the distillery, to meet the growing global demand for Glenfiddich. Glenfiddich celebrates its centenary with a special souvenir bottling of a cask opened on Christmas day 1987- exactly 100 years on from when the first spirit trickled from their second hand stills. The distillery releases one of the most collectible bottlings of all time: their first ever 50 year old Single Malt whisky, made of a vatting of nine casks first laid down in the 1930s, blended to perfection, with each cask representing one of William Grant’s children who helped him to build the distillery, over a hundred years before. Glenfiddich’s fifth Malt Master creates the Solera Vat, a pioneering system reminiscent of solera stacks used in Sherry bodegas: whereby when the oldest barrel is tapped, some of the next oldest barrel is used to replace the amount taken, and in turn, the next barrel is refilled with the next oldest barrel, and so on. This ensures a consistent product, and means that some percentage of the drink is of extremely great age. As this is whisky, the very youngest whisky in the vat must be at least 15 years old, or it would not be allowed to carry this age statement. Glenfiddich marks the new millennium with the release of two extremely collectible and valuable bottlings: the 1965 Vintage Reserve, a limited edition of 480 bottles, and Glenfiddich 1937- an extremely rare expression, with only 61 bottles released to general sale. This cask, number 843, had been looked after by no less than 10 Warehouse Masters, and is one of the rarest whiskies ever to be bottled. The recommended retail price was £10,000 and at the time it was the oldest whisky on the market. 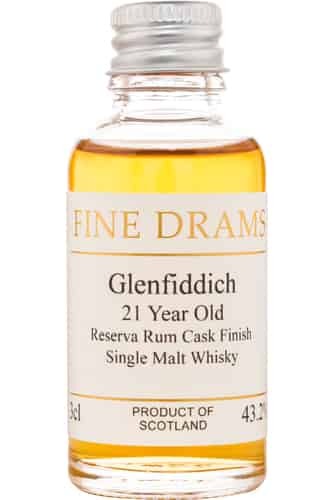 Glenfiddich releases Gran Reserva 21 year old, which was finished in Cuban Rum casks. This could not be sold in the US due to the then trade embargo between the States and Cuba. Caoran Reserve 12 year old was released, a rare, peated expression hoping to emulate the whisky the distillery produced in the early 20th century. Peated Speyside whiskies were, at one time, very common. Three more rare bottles are launched: 1973 Vintage Reserve (440 bottles), 1972 Vintage Reserve (519 bottles) and the 13 year old 1991 Vintage Reserve. Demonstrating that the distillery still places a great importance upon tourism and customer service, nearly £2 million is invested in a new visitor centre. Three more "Vintage Reserves" are released, with the distillery delving back into their oldest casks" the 1973 (861 bottles), the 1976 (31 years old) and the 1977. All three are very rare and highly collectable. Glenfiddich tops off the end of the first decade of the 21st century with the second batch of their 50 Year Old. This was an unbelievably rare whisky, with only 50 hand blown bottles being released annually. The bottles are adorned with luxury Scottish silver and finished in carefully hand-stitched leather, designed to reflect the leather ledger that the distillery’s founder, William Grant, kept over 120 years earlier. A very harsh winter strikes the UK, with record snowfall in many parts of the country. Northern Scotland got some of the very worst of the weather, and the heavy snowfall caused a warehouse roof to collapse, exposing the maturing casks to the harsh elements of the Scottish winter. Warehousemen at the distillery work around the clock in nearly -20 degree Celsius to save the barrels. As an acknowledgment to this hard work and avoided disaster, the distillery’s Malt Master creates the limited edition single malt Snow Phoenix- an acclaimed work of blending, and a stroke of marketing genius. The bottling represents the distillery triumphing against adversity, and rising from the snowy ashes! Glenfiddich also releases a 40 year old bottling this year. Glenfiddich produce 11 bottles of 55-year-old whisky to honour the last surviving grandchild of their founder, Janet Sheed Roberts, renown for her educational achievements. All eleven bottles are sold at auction for record prices, with all proceeds going to charity. This same year, Don Ramsey, the longest serving cooper in Scotland retires, having joined the distillery on Christmas day 1961, when he was only 15. 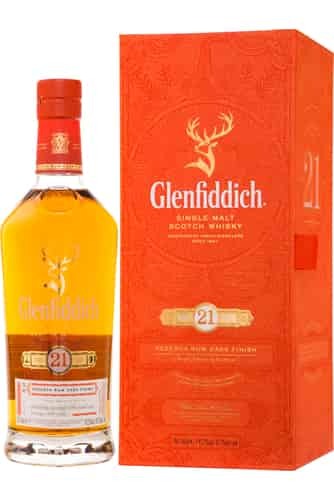 Glenfiddich estimate that he created over 200,000 casks during his career.